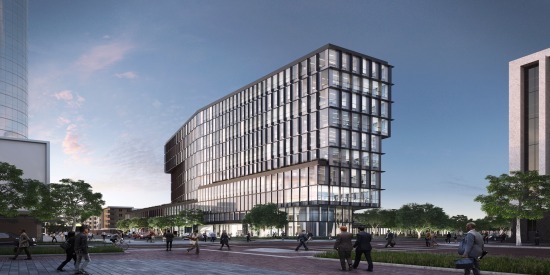 The redevelopment of Indianapolis‘ Market Square area continues with the announcement that Deborah Berke Partners of New York City will work with locally based RATIO Architects on a 10-story office tower and “significant public green space” to replace a surface parking lot. In renderings released Wednesday, a slim, glassy tower hefts the bulk of its block-wide breadth southward, collecting sunlight as it reaches a low-rise mass around lush green space bordered by Market, Alabama, Washington, and New Jersey streets. 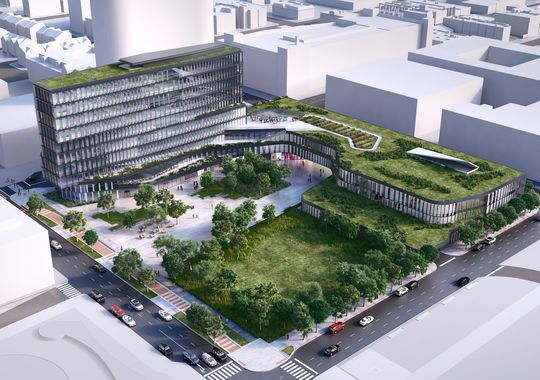 Green roofs blanket both buildings, which will each have about 15,000 square feet of first-floor retail fronting onto a pedestrian plaza. The programs include a parking garage and conference center, as well as office space and retail. “This is the new vocabulary in architecture, tying together buildings and green space,” Marquez said. Along with a 28-story residential tower planned across the street, a rebuilt plaza space nearby and a sleek, new $20 million transit center by the City-County Building, Cummins’ plans represent somewhat of a rebirth for this long neglected corner of downtown Indianapolis. Deborah Berke Partners beat out New York colleagues SHoP Architects and Tod Williams Billie Tsien Architects for the job.